InStyle tests out Sally Hansen Insta-Dri Nail Color to see if it lives up to its promise of a single sweep, one-coat polish that dries in just one minute. The results were positive. "The brush is amazing. 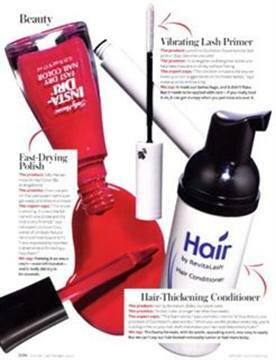 It covers the nail in one stroke," New York nail expert Jin Soon Choi tells the magazine. Editors add, "Painting it on was a cinch—even left-handed—and it really did dry in 60 seconds."